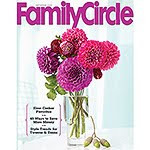 Three free issues of Family Circle magazine courtesy of valuemags.com. No strings, do it! May, June and July issues absolutely free. Go HERE and sign up now! !